Given the interactive nature of an unconference, we need to limit the number of attendees so that everyone will be able to participate and play an active role. At this year’s workshop we can accommodate 50 unconference-rs! 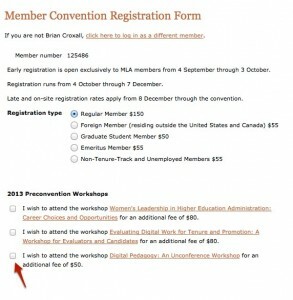 Registration is on a first-come, first-served basis and takes place when registering for the MLA Convention, under the pre-convention workshops. There is a $50 fee for attending the workshop. Just make sure you tick the last box and you’re on your way! What do I need to know before coming to the unconference? Again, you don’t need to know anything more about the unconference format itself than what’s on the website. Just be ready to play along and be generous by sharing your ideas and encouraging other participants to do the same! As far as digital pedagogy, all you need to know is that you’re interested in the subject. Of course, if you have some experiences with digital pedagogy that you can share with your fellow workshop attendees that will help as well. Remember, we’re going to be working together to make this workshop happen!